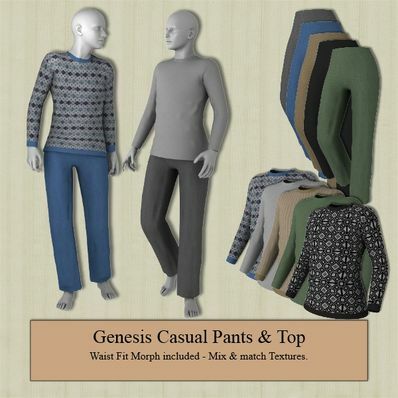 Casual Pants & Top for Genesis for use in Daz Studio 4.6. Should work with most poses and shapes. You did a great work. Thank you. Thank you! I love having everyday outfits like this available for characters. Thank you with grateful ness! Just so life-like, like clothes one would normally wear. Thank you for the various textures too! Thank you so much for all your contributions!!! A fine everyday outfit - just what I needed. Thank you very much! Thanks for this wonderful creation! Thank you Wendy for the great outfit. Love your work! Thanks for another beautiful and very useful outfit! Thanks for the new site too! Thank you for this really nice set! Top notch as always Thank You! Thank you so much! Really fine work! Updated file now uploaded. Sorry about that. A couple of files missing, will upload an updated file as soon as it is ready. Lovely outfit, thank you Wendy!